1. To make the dough: Adjust oven rack to lowest position and heat oven to 200 degrees. When oven reaches 200 degrees, turn it off. Lightly grease large bowl with cooking spray. Coat each of two 9-inch cake pans with 3 TB of oil. 2. Mix milk, sugar and remaining 2 TB pf oil in measuring cup. Mix flour, yeast, and salt in standing mixer fitted with dough hook. Turn machine to low and slowly add milk mixture. After dough comes together*, increase speed to medium-low and mix until dough is shiny and smooth, about 5 minutes. Turn dough onto lightly floured counter, gently shape into ball, and place in greased bowl. Cover with plastic wrap and place in warm oven until doubled in size, about 30 minutes. 3. To shape and top the dough: Transfer dough to lightly floured counter, divide in half, and lightly roll each half into ball. Working with 1 dough ball at a time, roll and shape dough into 9 ½ inch round and press into oiled pan. Cover with plastic wrap and set in warm spot (not in oven) until puffy and slightly risen, about 20 minutes. Meanwhile, heat oven to 400 degrees. 4. While dough rises, put half of pepperoni in single layer on microwave-safe plate lined with 2 paper towels. Cover with 2 more paper towels and microwave on high for 30 seconds**. Discard towels and set pepperoni aside; repeat with new paper towels and remaining pepperoni. 5. Remove plastic wrap from dough. Ladle ⅔ cup sauce on each round, leaving ½ inch border around edges. Sprinkle each with 1 ½ cups cheese and top with pepperoni. 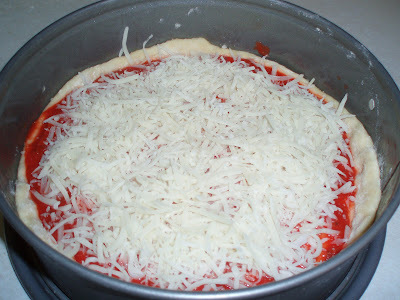 Bake until cheese is melted and pepperoni is browning around edges, about 20 minutes. Remove from oven; let pizzas rest in pans for 1 minute. Using spatula, transfer pizzas to cutting board and cut each into 8 wedges. Serve. In step 2, mix the flour, yeast, and salt together in a large bowl. Make a well in the flour, then pour the milk mixture into the well. 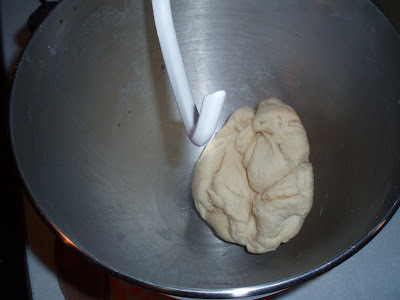 Using a wooden spoon, stir until the dough becomes shaggy and difficult to stir. Turn out onto a heavily floured work surface and knead, incorporating any shaggy scraps. Knead until the dough is smooth, about 10 minutes. Shape into a ball and proceed as directed. *If the dough doesn't pull together, add a TB of water. Continue until the dough pulls together, this can happen based on the weather and the humidity in your kitchen. 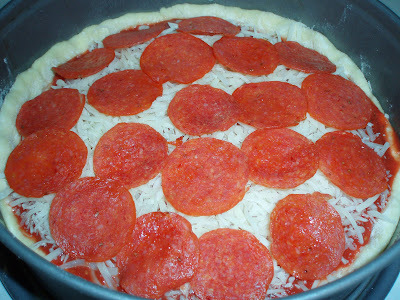 **This step will render out excess fat from the pepperoni, soaking into the paper towel, instead of your pizza. 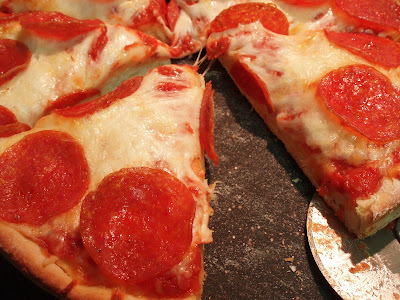 We also find that on the finished pizza, you will have pepperoni that is slightly more crispy. One pizza is the right size for dinner for two. I made the full amount of dough and reserved the second half for a later use. I placed in a zip bag in the fridge and will report back on it's later usage! Perhaps a calzone! Also, I didn't have skim milk. I used dried milk, reconstituted with water. Worked very well. If I didn't have that, I would have used ½ heavy cream and ½ water for the total amount of liquid needed. For the sauce, I used one 14 oz can of tomato puree (slightly thicker than straight canned tomato sauce). I seasoned with about 2 TB of Pizza Seasoning from Penzeys and a little extra salt/pepper to taste. Very nice. I was skeptical of the seasoning blend, but it has a very nice balance of all the right herbs and spices. Let's take a look at the process shall we? The dough came together with a little coaxing from some additional water. Notice how nice and clean the bowl is! 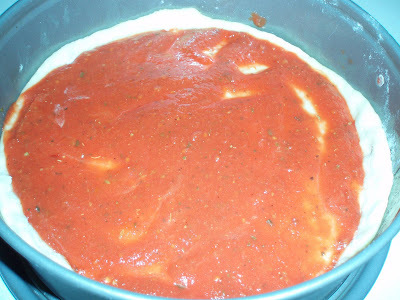 The dough has been rolled out and the sauce added. And cheese. I also added a little parmesan to the blend for some extra flavor. The partially cooked pepperonis. I liked that my pizza was all greasy afterwards. Sadly, with the best masterpieces of the kitchen, you must destroy them to truly enjoy them. I watched the full episode time and again, taking meticulous notes, but it didn't include all the measurements. I have cookbooks from every year and none of them had this recipe! Thanks for helping me out with the milk amount, etc. Thanks for posting this! I lost my ATK printed copy and the recipe isn't in their "complete" cookbook.